Boston Crusaders tenor drummer and percussion section leader, Adrian Valderrama, 21, talks with DCI.org's Christina Mavroudis about being the only female in the drum line and how she has had to physically prepare to march with a set of tenor drums. CM: What are the challenges of being the only female in the drum line? AV: There are many challenges, but they're not so bad once you get used to the brotherly love that goes on. I try not to be too overpowering as the percussion section leader, and I treat everyone as best as I can. They're really like my brothers though. I take care of them and they take care of me because we're all in this together. CM: Tell me about the audition process in the drum line? AV: The audition process can be tough, especially since every veteran has to re-audition for a spot. The staff is not afraid to make one of them an alternate if they're not up to par with the standards of our drum line. We always start in November and just work on the basics so everyone has a fair chance. CM: How have you personally prepared for the auditions each summer? AV: This year, there are three or four people in the drum line that go to my school in Texas, so I got together with them to drum whenever I could to keep my "chops" up. CM: How do you physically prepare specifically to march as a tenor drummer? AV: I'm not sure if you can. The first year was definitely the hardest since I wasn't used to all that weight on my body when carrying the drums. But every year I got more and more muscle in my body so it got a little easier for me. I've basically spent my whole drum corps career trying to get used to it. Now, I have some ridiculous calf and arm muscles from the workout! CM: What are the challenges between tenor and snare drums? AV: Other than the extra 20 pounds that you have to carry, there are a lot more technical aspects to deal with when playing tenors. We have more to worry about with five different drums; how our arms look, our hand placement and how our sticks are moving from drum to drum, just to name a few. CM: What do you plan on doing after "aging-out?" AV: I really don't know what I'm going to do. I don't play much music outside of drum corps, so this season was probably my last time performing, which is kind of sad. CM: What are you going to miss from the Boston Crusaders? AV: I'm going to miss the staff, the people and the alumni that I've met here. 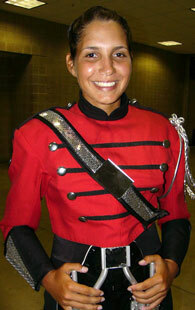 There are a lot of great people in this drum corps that I'm going to miss a lot. I've met some of my best friends here, and I'll never forget them.